The holidays are here and it’s time to deck the halls. Decorating for the holidays can sometimes be daunting, especially if you’re starting from scratch, but it doesn’t have to be! Here are a few simple tips that will make sure your home is both merry and bright all season long. Everything begins with a plan. 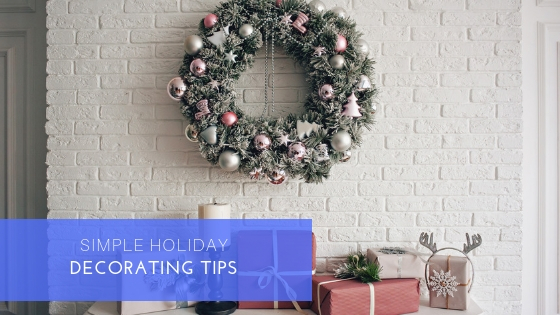 Before you begin purchasing new decorations and ornaments, figure out the theme that will tie your decorations together into a cohesive design. Your chosen theme will also dictate the types of decorations and ornaments you’ll ultimately purchase. It can be difficult choosing a theme but the best place to begin is by looking at your everyday design style. If your normal style swings more modern, you’ll want to carry that over into your holiday décor. Do you have a sentimental item you want to incorporate or a specific color you’d like to use? Those can be the foundation of your new theme. Decorating themes can be created from colors, shapes or symbols, patterns, or even a style or mood! Once you’ve selected your overall theme, you’re ready to pick a color palette. You can go the traditional route with reds, greens, and golds, a neutral color palette of black and silvers, or even bright hues! Whatever colors you choose, try to keep the palette limited, with two to three colors. Limiting your color choices will make the decorations flow from each room better. Here are some great color combinations you can try this holiday season. The temptation to make your home look like Santa’s workshop is real but you don’t need to fill every inch of your home with holiday decorations. Instead, focus on a few statement pieces (like a tree or mantle) and a few small vignettes throughout your home. This will give your home a festive feel without the overwhelm of too much stuff. Last but not least, make sure you’re having fun: put on some music or a favorite holiday movie, pour some eggnog or hot cocoa and have a decorating party with the family! The holiday season can be lots of fun and decorating your home can really get you into the festive spirit.